Vern Mesler has thirty-four years experience working as a welder, steel fitter, structural steel foreman and materials manager at Douglas Steel Fabrication Corporation in Lansing, Michigan. He was an AWS Certified Welding Inspector (CWI). During eighteen years as a foreman, he was involved in the fabrication of bridges for Michigan’s state highways and steel trusses for major buildings, and he directed welding operations for these and other structures. He is now retired. Vern Mesler also has over thirty years experience as an adjunct welding instructor at Lansing Community College. Vern Mesler serves as Project Manager for Historic Bridge park of Calhoun County, MI and is also an advisory board member of the Historic Bridge Foundation. 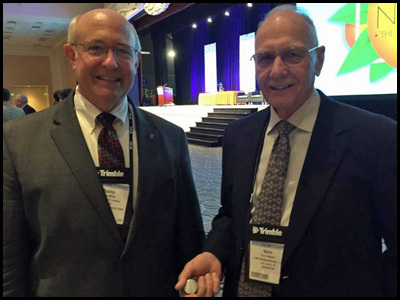 Above: Vern Mesler (right) standing next to Duane K. Miller, P.E., Sc.D, of The Lincoln Electric Company who received the Robert P. Stupp Award. In 2016, Vern Mesler received a Special Achievement Award from the American Institute of Steel Construction (AISC) for 40 years of teaching skills associated with welding, fabrication, corrosion repair and hot riveting to thousands of students at Lansing Community College, and for encouraging those students to pursue careers in the steel industry. And for his establishment of the historic bridge park in Calhoun County, Michigan which contains six steel bridges, that Mr. Mesler and his students restored to the same functional condition as they were originally built, and which continues to serve as an educational site for students and engineers to understand past bridge design and construction techniques.